The very first commercial AGS (Adventure Game Studio) title, the designer stopped printing new copies and proclaimed it as "abandonware" in December 2003 but re-released it again in 2009. 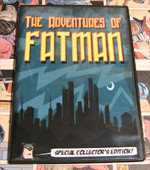 Fatman, who looks like Batman's more obese cousin, is the crime fighter for the city of Shadowlawn. Just when you are complaining about how dull things have been, a supervillain named Toxicman is created from a botched act of corporate sabotage. It is up to you, then, to tear yourself away from food long enough to save the city from certain destruction. The game plays like a typical point-and-click adventure game. Puzzles tend to be on the easy side, but there are several more interesting ones that require correct timing. All the puzzles are logical, although there is a few far-fetched ones that seem to be there only for the sake of lengthening the game. While you cannot compare the graphics to commercial releases, the cartoon style is consistent with the game's wacky sense of humor and comic-book-hero premise. Backgrounds are well drawn and animated, and there are few cases of hunt-the-pixel problems (most at the beginning of the game). Bonus points must be given to the cast of voice actors, who did a much better job than numerous commercial CD-ROM games. The designer himself and Francisco Gonzalez are especially outstanding as the voice of Fatman and Toxicman, respectively. In addition to full voice, the CD-ROM also contains funny outtakes, deleted scenes and animations, as well as Pizza Quest, Michael Doak's first game. In March/2007 a Special Edition was released with an all new alternate ending, and new easy to use EXIT pop-up mouse mode. You could explore Fatman's bedroom, one of several re-mastered backgrounds and additions, and find the 9 Easter eggs, the extra 5 points and solve the new end game puzzle.